My Favorite Color is Green, My Father and my husbands father, have ancestors from Ireland and Scotland. We love to eat corn beef, sauerkraut and hash. We welcome a good dark porter beer or a Guinness stout at our table. As a child, I always wanted to see the end of a rainbow. A few extra gold coins would have been a nice surprise for my folks. Today, I’m happy right where I am. I have an Unfailing Faith, good friends and family around, a wonderful husband to share life with and some good ole’ hard work, everyday! 1. May the luck of the Irish be with you! 2. If you want praise, die. If you want blame, marry. 3. Here’s to a long life and a merry one. A quick death and an easy one. A pretty girl and an honest one. A cold pint and another one! 4. 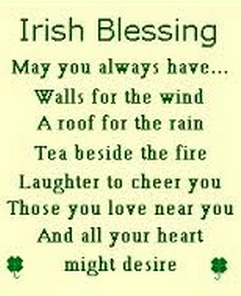 If you’re enough lucky to be Irish… You’re lucky enough! 5. May you have the hindsight to know where you’ve been, the foresight to know where you are going, and the insight to know when you have gone too far. 6. A man may live after losing his life but not after losing his honour. 8. You’ve got to do your own growing, no matter how tall your father was. 9. It is often that a person’s mouth broke his nose. 10. It is better to spend money like there’s no tomorrow than to spend tonight like there’s no money! Tonight, I needed to come up with a dish that is green:) So, I searched my pantry, ‘frigerator, chicken coop and garage..that’s where I store, last seasons garlic. I came up with an old favorite with a little twist of sweetness. We are having a “not so” traditional St. Paddy’s day dinner. Instead we would like to celebrate with an American Irish Breakfast: Eggs, corn-beef hash, fried bacon, sour dough bread, coffee with St Brendan’s irish cream. Cut the top 1/2 inch off each head of garlic, exposing the cloves. Set the garlic in the center of a square of heavy aluminum foil. 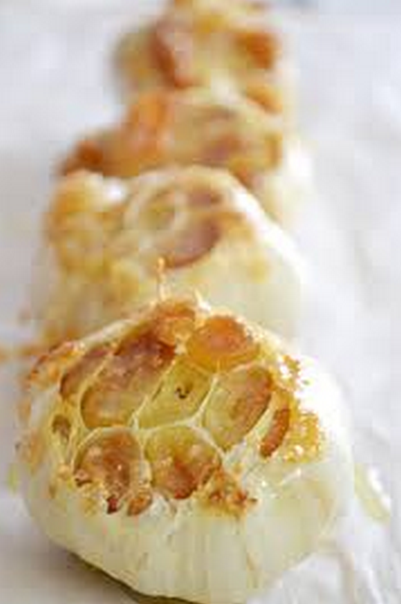 Pour 1 teaspoon of the honey and 1 teaspoon of the olive oil over the garlic, replace the tops, and fold up the sides of the foil to make a package, crimping the top tight. Bake until very tender and golden, 40 to 45 minutes. Transfer the baked garlic to a bowl, including all the juices in the foil pouch. When cool enough to handle, remove the garlic heads and carefully pop out the garlic cloves by pushing up from the bottom; try to keep the cloves intact. Add the remaining teaspoon honey and tablespoon olive oil and gently stir to combine. Heat a very wide skillet over medium heat, and add the butter and pine nuts. 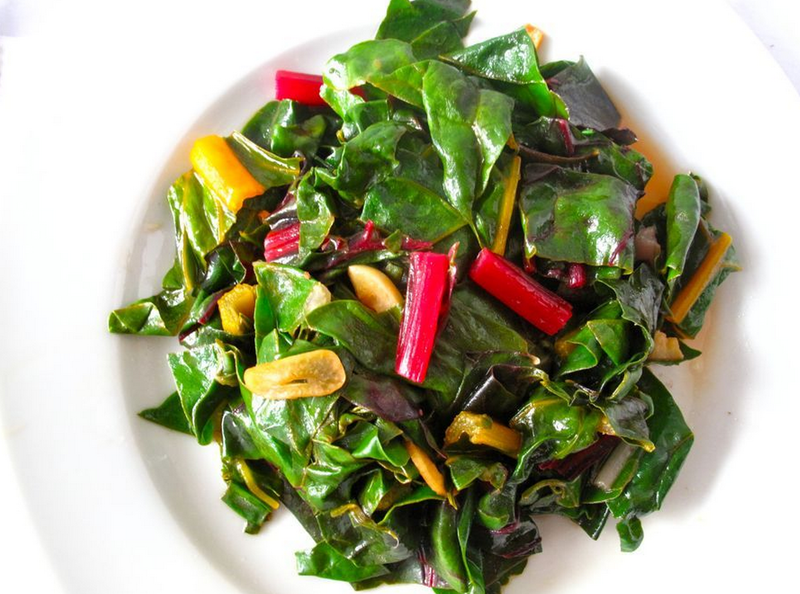 When they begin to sizzle and turn golden brown, add half of the Swiss chard. Cook, stirring, until the greens wilt, a minute or two. Add the remaining chard. Once all of the chard is wilted, season with salt and pepper, and cook until most of the liquid has simmered off, another 2 to 3 minutes. Add the honey-roasted garlic to the chard, mix very gently to combine, and serve. you can also add chopped almond and cranberries to add a little crunch. either way, you will have them coming back for more.